To avoid wasps in the house my wife and I don’t put out wasp traps, we leave a little jam or honey in a jar down the garden, the wasps, and other insects love it and do not seem to bother us. Unfortunately we did not reckon on the recent heavy rain which flooded the jar and drown many of the wasps feeding in it. The jam jar stood on a wrought iron pot stand and as some of the wasps were still alive I tipped them out into the pot holder. Those survivors that were able crawled out to dry and eventually flew off. Next day I inspected the tray and found that it was being visited by wasps which were exhibiting strange behaviour. They were apparently going over the carcasses, probably cleaning them of the remains of honey that they had drowned in. But then they decapitated the corpses to access the flesh in the thorax. This is where the ants came in. They too were going over the dead wasps again probably to clean up the sweet residue. However, the amazing thing was that the ants began picking up the severed heads and carrying them off down the legs of the pot stand and across the garden. 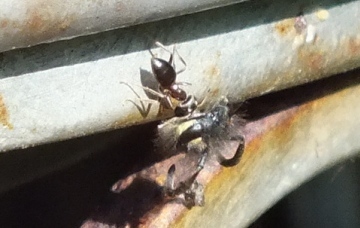 It was peculiar to suddenly see a wasps head coming up over the rim of the holder. A first you couldn't see the ant just the head moving along.